This type of news we imagine is becoming quite the thorn in a certain manufacturer’s side. 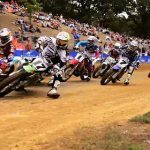 Indian Factory Racing and its Wrecking Crew aboard the FTR750 continues to dominate the American Flat Track competition. 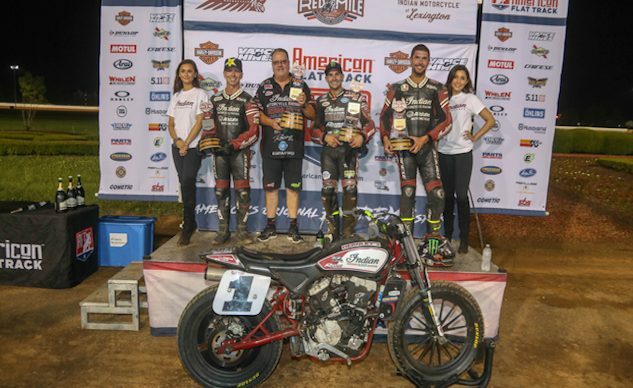 LEXINGTON, KY – June 4, 2018 – Indian Motorcycle Racing secured its fifth consecutive all-Scout FTR750 podium, as the factory Wrecking Crew placed 1-2-3 at the Red Mile. Reigning Grand National Champion and current points leader Jared Mees continued his dominating season by earning his sixth win in 2018. Fellow Wrecking Crew riders Bryan Smith and Brad Baker rounded out the podium with second and third place finishes. After winning each Semi, Mees and Smith earned the top starting positions for the Main. Mees jumped out to an early lead and steadily increased his lead on Smith. Baker, who had a tough start from the third starting position, battled his way from the middle of the pack to the third-place position. After a red flag restart, Mees again stretched the gap between he and Smith, while Baker battled with Indian privateer Henry Wiles (Wilco Racing/Willy Built/Bandit Industries) and secured the final podium position by .008 seconds. Of the 11 Scout FTR750’s competing in the Main, 8 finished inside the top 10. In addition to the top four positions from Mees, Smith, Baker and Wiles, Indian Motorcycle privateers Chad Chose (Indian Motorcycle of Oklahoma City), Jeffery Carver Jr. (Roof-Systems, Indian of Metro Milwaukee) and Kenny Coolbeth Jr. (Nila Racing/Columbia Avionics) placed sixth, eighth and 10th, respectively. 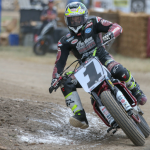 The Red Mile marked the first race Jake Johnson (Estenson Racing, McCandless Truck Center) put the Indian Scout FTR750 into competition, where he finished in ninth place. Through eight races, Mees holds a commanding lead with 170 points, while Wiles ranks second with 116 points. Baker’s third-place finish moves him up the leaderboard from sixth to third overall, with 101 total points. Carver and Coolbeth rank fourth and fifth with 99 points. Meanwhile, Smith is pushing his way up the leaderboard after suffering a broken left fibula and missing two races. Since returning three weeks ago, Smith has reached the podium twice and had a top-five finish. He currently ranks ninth with 73 total points. The Indian Wrecking Crew and stable of privateers aboard the Scout FTR750 will continue its season on June 16 at the OKC Mile. 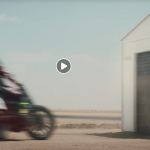 For more information on Indian Motorcycle Racing, backed by Allstate Insurance, the Indian Wrecking Crew and Scout FTR750, visit IndianMotorcycle.com and follow along on Facebook, Twitter & Instagram. For information on purchasing a Scout FTR750, please contact Racing@IndianMotorcycle.com.